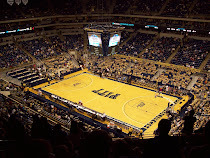 So Pitt went out and picked up another commitment for 2011 in 6'11" center Malcolm Gilbert. With the commitment of Durand Johnson about a week ago, it looked like Pitt might be done recruiting. After all, they'd reached their anticipated limit of three scholarships for next year. 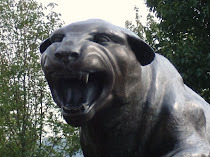 For the second consecutive year, Pitt has gone over their limit and may need to boot someone from the program to balance things out. Yes, the school can 'hope' someone doesn't qualify academically next year, but as this offseason proved, you can hardly count on that. Not that Pitt couldn't use a center. They hadn't gotten a true center since Cassin Diggs and Gary McGhee three years ago and it was good to see them get more size. Gilbert is a three-star recruit as rated by both Scout and Rivals. He also grades out at a 92 according to ESPN's Insider Ratings. He reportedly had drawn interest from ten schools including Ohio State, Wake Forest, Villanova, Virginia, Virginia Tech, Clemson, Notre Dame, and a few others. And at one point, there was apparently some interest from Duke and Georgetown. The first thing you might notice is that even though he's 6'11", he's reportedly only around 215 pounds. Yikes. Yes he's young, but he'll need to add around 30 pounds to bang in the Big East. He was set to make a decision in September and with Durand Johnson committing, you have to wonder if Pitt made him speed up his decision-making a bit. As I mentioned, the class was already full and maybe Gilbert figured it was now or never. Q. You averaged a near 12 blocked shots in high school last year. Is the art of altering a shot something you’ve always been good at? A. Since I can remember, I’ve always been able to block shots. I just always had the hops, I guess you could say. Other than deciding who may be gone from Pitt, the other underlying theme of this is that Pitt has to be out of the running for one of the four-star centers, Amir Williams and Desmond Hubert. Part of me is glad to see Dixon land a center, but the other part is really hoping that Pitt had no shot at either guy. Both apparently have more of a game than Gilbert. My confidence is pretty strong in Dixon, though, and I'm guessing that Pitt either felt like they had not shot with either Williams or Hubert or Dixon was determined to get an answer fairly quickly. Either way, it will be interesting to see what happens next season if all of the incoming recruits qualify. Pitt needs a point guard desperately. Woodall totally erratic, dribbles with his head down like high school players, misses open men regularly,not quick enough. Epps not the answer either. They need offense. not defense. The need shooters. Enough defensive players who can't score.